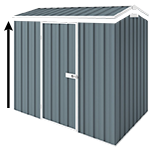 Another competitively priced YardSaver garden shed that is very popular for narrow but deep places. The YardSaver G78 Garden Shed is another competitively priced YardSaver garden shed that is very popular for narrow but deep places. This model is large enough to store your mower, blower, wheelbarrow, whipper-snipper, work tools, gardening gear safe and sound and everything else that you can think of. Hi is the "width" the side with the door? I can't tell if the if the longer side is with the door or not.Maybe some overhead plans or some figures on the picture would be a good idea? Cheers.